Oh Yumm Yumm that pizza looks so yummy. It may be only breakfast time at the moment but I could go one right now. I love your vintage recycled style. Oh that is a classic Simone, so funny. It looks yummy. mmmm!!! que rico!!!!!! simonne that is life!!!! 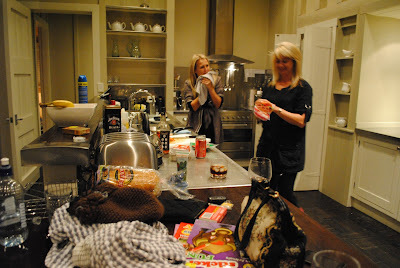 that kitchen so beautifull full of life and movement!! !and happyness and sharing with family and friends!! !yes yes yes that is the paradise!! !the pizza looks DELICIOUSSSS!!! !AND YOU TWO LOOKS VERY VERY HAPPY!!! !beautifull post!!!!!!besossssss!!! Your crust came out great!.. Good idea, I may have to try this!. Umm,Can I have some pizza? It looks delicious!! Well.. It looks good to me! You might have discovered something!!! AH!,,,and I love your bag!,Is it Fendi´s? I love the eggs on top. Well I have to say: Congratulations! 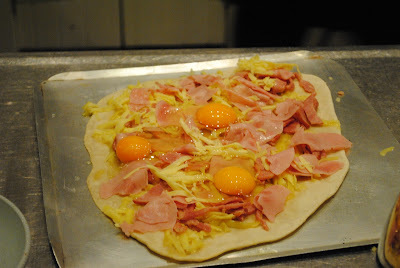 With no idea in how to make a pizza and this is how it look like? Start a business, I'm your first client! I love your pizza - It looks SSOOO yummy!! What a lovely spacious kitchen. OK, eggs were a little strange. But hey, I bet it tasted good. I'm not too sure about the eggs on pizza. Looks like a breakfast pizza. How was it with the eggs? I laughed when I saw them! I think with pizza, half the fun is in making it and throwing whatever together. Seriously that sounds delish. Breakfast pizza? FAB FAB! you look like you had a great time! The pizza looks so good and the house is amazing...I'll day dream i'm there!! Ha ! I knew I was not the only one - I make "Pizzas" from whatever is in the fridge too ! I have even made sort of a Pizza in a pan on the normal oven plate - as the bakin goven was defunct then... as long as it is yummy - who cares ! BTW - I like the eggs on top ! You know, this actually sounds good! But then, with the ingredients you used, it would have to be good. My boys would really love this! ps Thanks so much for your sweet comments...and for the photos that stirred so many memories. That Pizza looks mighty yummy to me! I never met an Aussie who couldn't cook. I just knew you had it in you. How good does that pizza look! For a 'just throw it together and hope for the best' attempt, I hope it tasted as good as it looks! LOL, my dad used to say the same thing about me! Seriously! I think God has a sense of humor though as I ended up with 6 kids, so I had to learn how to cook...a little :-) My husband is still a better cook than I am, and my daughters will soon pass me up too. It sounds like my kind of pizza. Cheese and ham together are always yum, aren't they? I'm glad you had such a great time. What do you mean you can't cook! Those cupcakes looked fine to me!! AND.... if you can teach yourself to sew then what so hard about cooking! The beach house looks absolutely fabulous. You have such a blessed life. Looks like an awesome time. Uh-uh! That's brilliant. I've never seen such a thing but I sure want one now! Wow...I've never seen eggs on a pizza...but it looks yummy! 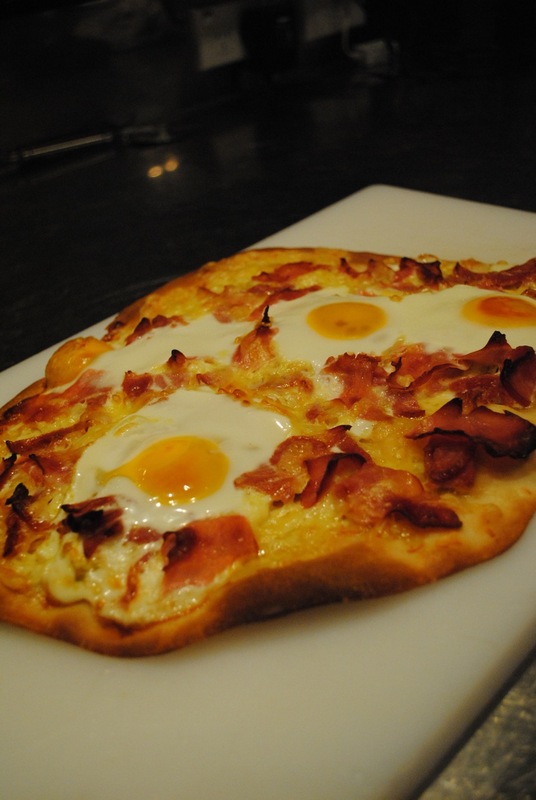 Oh, that pizza looks so gorgeous with the eggs..., I have to try that!! i would eat the hell out of that!!!! Wow! Do you have any recipes? I want to try it.